There are a number of settings in this file that control how Markdown Monster behaves. Any changes you make in this document are immediately applied when you save the document (ctrl-s). You can also change configuration folder using the CommonFolder setting in the Markdown Monster Settings at Tools -> Settings. For example, you can easily set the folder to a shared location like Dropbox: CommonFolder="C:\\Users\\rick\\Dropbox\\Markdown Monster Common"
The application theme determines the application major theme for the window and controls. Any changes made to the ApplicationTheme requires a restart of Markdown Monster to properly render all the theme changes. The theme used by the Markdown editor. A variety of themes can be used including twilight,visualstudio,github,monokai, mono_industrial. You can also change the editor theme via the drop down on the bottom right of the form. These themes are stored in the Editor\scripts folder with a theme-. The theme used by the HTML Preview browser. Several themes are available including Dharkan, Blackout, GitHub, Hipster. You can also change the preview theme via the drop down on the bottom right of the form. These themes are fairly simple plain HTML themes and can be easily created or modified to match whatever style you want to see in the previewer. Look in the PreviewThemes folder. If true opens all documents in a single window. 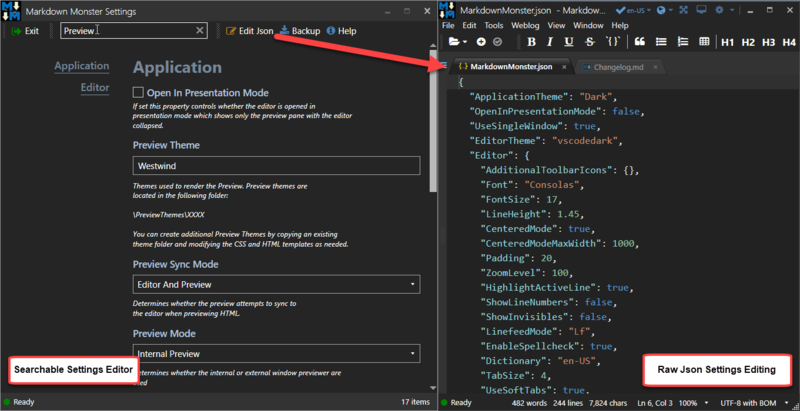 This is the default and preferred mode to operation Markdown Monster, but you can also force MM to open every opened externally in a new instance of Markdown Monster. Note if running without SingleWindow mode you may see inconsistent behavior in the Recent Documents list if multiple instances are open. If set to true starts the editor in presentation mode that displays the rendered HTML in full screen mode. If set the true all preview links that are http:// or https:// links are opened externally in your default system Web browser. If false links open in the previewer. We recommend you leave the default of true. If true displays the full path to the open file. Default is false. This flag lets you configure what UI components are hidden in distraction free mode as well as a couple of mode settings (maximized and maxwidth:width). Distraction free mode is accessed via the icon on the Window bar or via Alt-Shift-Enter. Each of the items included is hidden (except for maximized and maxwidth obviously). Any of these values included hide the corresponding UI item. Any option can be left out to not hide that item. maximized when provided maximizes the window, maxwidth:970 allows you to specify a maxwidth for the editor's content area which allows you to optionally provide lots of whitespace around text as is common in distraction free modes. The number is the width in pixels. If true automatically saves documents to disk as you type. Document and file are always nearly in sync (except for the 1 second or so no-typing delay before text is updated). This setting overrides the AutoSaveBackups option if set. No backups are created if this option is true. Set this option to true to backup your working files while you are working, but before they are saved. In case of a crash the backup document is opened in addition to the actual document so you can compare or choose the recovered content. No backups are created if AutoSaveDocuments is true. Determines whether the Preview is always refreshed fully or (default) just replacing the existing content. The default behavior of content replacement is quicker with less flicker, but cannot update embedded scripts or other dynamic content. If you are embedding dynamic content that includes script tags or expanding widgets set this flag to true. The name of the font to use in the editor. The font used has to be a monospaced font like Consolas (default), Courier New, Lucidia Console or installed monospace fonts like Fira Code, Haskell etc. Using proportional fonts likw Segoe UI, Arial, etc. doesn't work and will cause cursor offset issues. You can also use monospace which will default to the default monospace font (usually Courier New) for Internet Explorer. For more info please the Font Support topic. Font size in pixels and the default size is 18. The Zoom level is a percentage value (100 is 100%, 50 is 50%) that is a multiplier on the font size. This value is dynamically updated from ctrl-scrollwheel or ctrl-+ and ctrl-_ operations. This is mostly for internal use, but you can set it to 100 to clear the zoom level. The line height determines the amount of space including whitespace that that a single line of text takes up. Sizing is in relative units and the default value 1.35. You can specify a max width for the editor content to keep content from spreading over the whole width of the editing area when using very wide screens. MaxWidth can be used to provide a managable edit 'column width' and provide extra wide space for a pleasant, distraction free experience. A maxwidth:1000 setting can also be applied to the DistractionFreeModeHideOptions. Determines whether Markdown bullet auto-completion is enabled. This behavior automatically creates new bullets on enter. Default is false as the behavior can be annoying when using short lists and automatically generating an extra bullet on the last item that needs to be deleted. Determines whether the active line in the editor is highlighted. Highlight color is relatively subtle in most themes so this is recommended. Determines whether text in the editor wraps - almost certainly you'll want to leave this flag at true. Toggles the spellchecking feature in the editor. This flag is also triggered by the checkmark icon on the Window control box. Determines whether script tags are rendered into the HTML as is (as raw HTML script) or are encoded and stripped for security. Set to true if you want to embed script tags explicitly (like Gist Snippets or other Widgets for example). The number of spaces added by pressing the Tab key. Determines whether text wrapping is enabled. Set with the default of Alt-Z shortcut and on View menu. Optional margin at which text is wrapped. Default is 0 which means it wraps at the document's natural width. If you specify a value the editor wraps at that column. Note this setting may cause extra whitespace on the right side of the editor. If MaxWidth is set and the wrap margin is smaller the content will not be centered any more. Shows a print margin marker line on the right side of the document at the given margin. This can be useful in some cases to see how wide text is at a given location. Configures a numeric margin value where the print margin in ShowPrintMargin is displayed. The dictionary used. By default the US English one is used by de-DE, fr-FR and es-ES are also shipped. You can add any other OpenOffice compatible dictionaries using aff and dic files and reference them here by copying them into the Editors folder. More info. Markdown Monster allows you to open documents and/or navigate your system via a number of external application commands. Lets you specify an image editor to edit images. Used for right clicking on images in your Markdown text, or via the Folder Browser. Defaults to Paint.NET if installed, otherwise falls back to Paint as the default. Optionally lets you specify an external image viewer. Defaults to null which uses the system viewer (Photos typically). Note that MM automatically previews images in the editor as you click on them so this is not required often. This allows you to explicitly specify a Web Browser executable to launch an external preview. If this value is null it'll use the system default. Defaults to discovered location of Chrome or FireFox if installed, otherwise null. Determines the executable used to open a folder or folder file location in Windows. Defaults to Explorer.exe but can be any other Explorer replacement shell you use. The TerminalCommand is the command interpreter used which defaults to Powershell. The arguments are the stock arguments to open the shell in a specific folder. There are a number of options that allow you to configure how the Markdown Parser interprets the Markdown text. Allows for Github checkable task lists by using [ ] and [x]. Support for Mermaid markup. Note the MM preview doesn't support Mermaid, but the renderer produces it and you can preview in the external browser. Last used Folder Path that is remembered when the FolderBrowser is opened again. This section of the configuration determines how frequently Markdown Monster checks for new versions. The remainder of the settings are operational settings that store current state of the application like open documents, window position, last folder used and so on. You see it here in the edit view and you can certainly modify things here, but typically you'll leave those values alone. This section holds collection string values that map a file extension (key) to an ACE Editor syntax language. You can create multiple extension mappings to the same syntax language, so you can map xml and xaml and config files all to the xml syntax for example. These section hold your last window positions and widths for various panels. While you can edit these values, these are reset each time you shut down Markdown Monster.